Alf, our big red vintage London Routemaster bus has been lovingly restored to it's original condition and painstakingly presented in a stunning red and white livery, Alf is the only way to travel. Collect your wedding guests, and/or yourselves, in a never-to-be-forgotten way and arrive for your special occasion in style. Simply use the form on CONTACT US, or email your requirements. Please include the ceremony date and time, collection point/s, the ceremony and reception places (with post codes) and times. Also, how many wedding guests will be boarding, whether the bride and groom will be travelling on Alf and we'll be very happy to send you a quotation. So just remember, it's always better by Alf ! 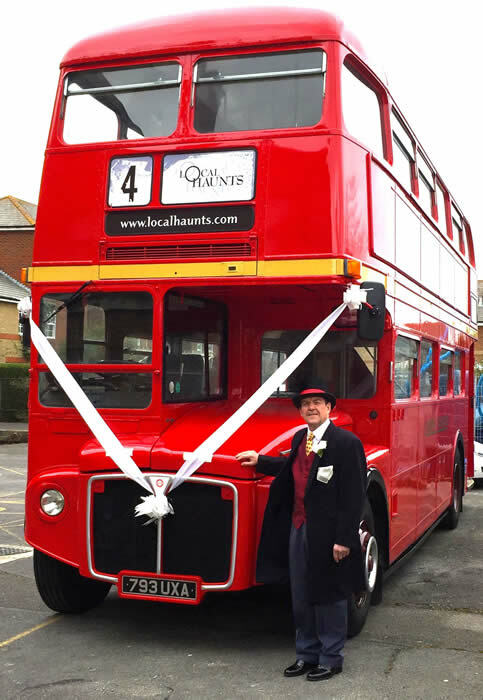 If you require a wedding car to match our iconic London Routemaster bus, "Alf", please ask us and we will try and help you find the perfect car, suitable for your "special day". Hauntingly beautiful, silently sinister, or curiously comical, what better way to welcome your guests, than a Local Haunts living statue ? ?